Bullion Exchanges in collaboration with Manfra, Tordella, & Brookes, and the world class refinery Royal Canadian Mint are pleased to release the 2015 10 oz $100 Silver Coin in celebration of Albert Einstein’s Special Theory of Relativity featuring an iconic image of Einstein taken by Canadian photographer Yousuf Karsh. The Royal Canadian Mint produced this custom design with a limited mintage of only 1,500 coins. These coins have been graded as a perfect Proof 70 Ultra Cameo by NGC: the perfect coin, as minted, with no trace of wear, handling, scratches or contact with other coins from a (5x) magnification. The label features the picture of Albert Einstein used to produce the obverse design, as well as some of Einstein's iconic E=mc² formula in the background. While produced by the Royal Canadian Mint, Bullion Exchanges is the exclusive distributor of this stunning coin in the United States. 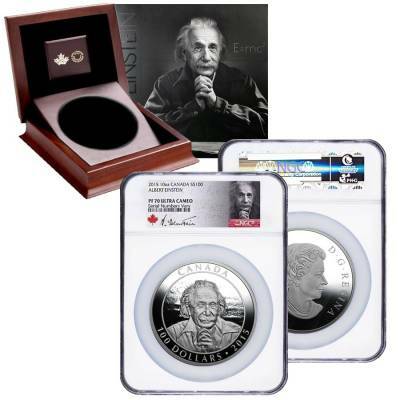 Join the global celebration with this historic 10 oz fine silver coin commemorating Albert Einstein’s Special Theory of Relativity! 2015 celebrates the 100th anniversary of the General Theory of Relativity and the 110th anniversary of the Special Theory of Relativity. This exquisite coin features an original portrait of Albert Einstein taken by Yousuf Karsh in 1948, who is famous for his portraits of Sir Winston Churchill, among other politicians, dignitaries, royalty, and celebrities. 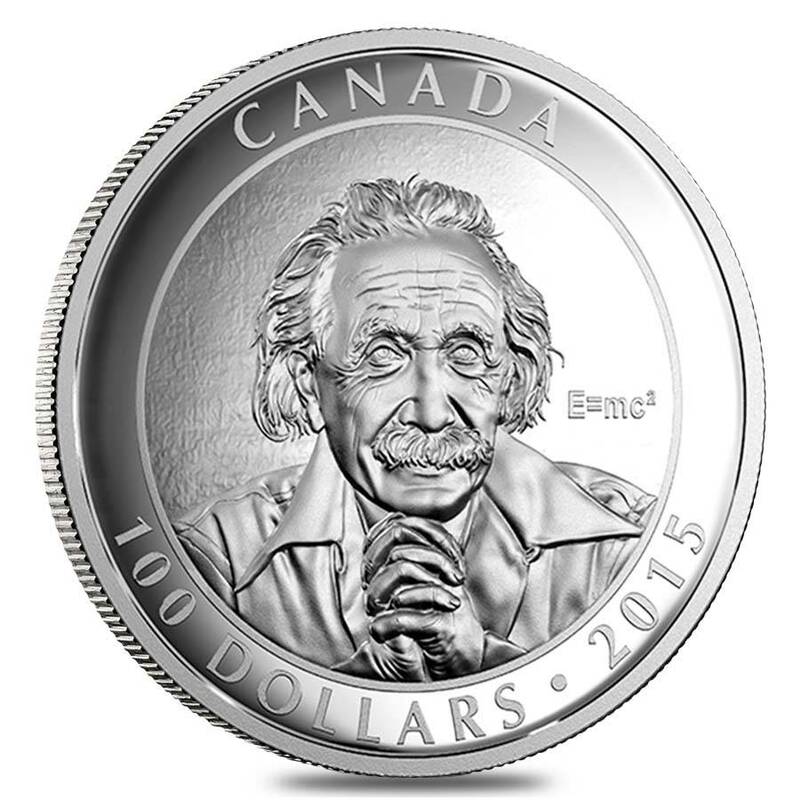 The 2015 $100 Albert Einstein Fine Silver coin highlights a unique Canadian connection to Einstein. Canadian photographer Yousuf Karsh (1908-2002) is considered one of the masters of the twentieth century. Royal Canadian Mint engravers have expertly reproduced the original portrait taken by Yousuf Karsh in 1948. This coin has been exceptionally crafted with exquisite detailing, multiple finishes and a proof field to capture the subtleties of light and form as revealed in Karsh’s original photograph. As a unique addition, Einstein’s breakthrough formula E=mc² has been included within the image. 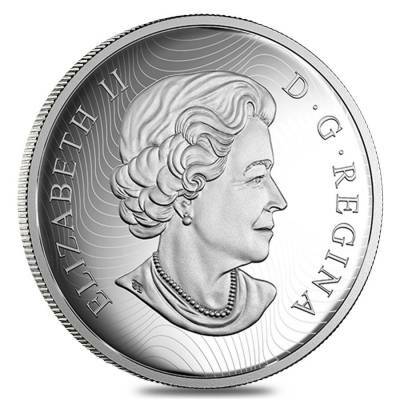 The mintage of these coins will be strictly limited to only 1,500 coins making them highly collectible and sure to be sought out following the success of the 2015 1 oz Silver Canadian Maple Leaf E=mc² Privy Reverse Proof Coin. Reverse: The reverse design features Karsh’s famous portrait of Albert Einstein taken in 1948. As a unique addition, Einstein’s breakthrough formula E=mc² has been included within the image. Inscribed on the border are “CANADA”, “100 DOLLARS”, and “2015”. Observe: Gracing the obverse side of this coin is the effigy of her Majesty Queen Elizabeth II by Susanna Blunt. Inscribed near the border are “ELIZABETH II”, “D.G. 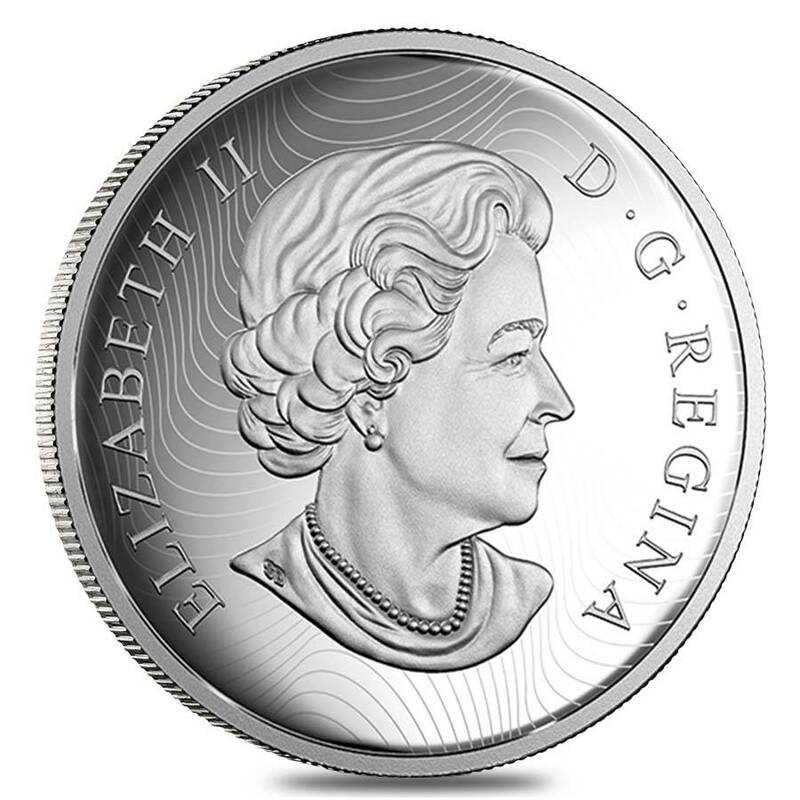 REGINA”, along with the coin’s denomination and mintage date. 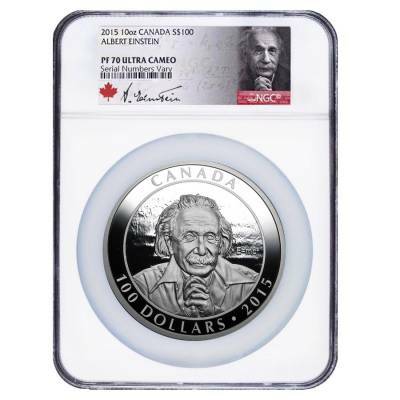 The 2015 10 oz Royal Canadian Mint $100 Albert Einstein Silver Coin has been stunningly crafted featuring multiple finishes and a proof field to capture the subtleties of light revealed in Karsh’s original photo. Although this is a certified coin, each coin will still come with a maple presentation case and a graphic beauty box baring Einstein’s image taken by Yousuf Karsh, breakthrough E=mc² formula, and Karsh’s signature. This coin is a must have for Einstein fans! Physicists, astronomers, historians; anyone with a passion for science and Einstein’s genius will cherish this original upscale keepsake. 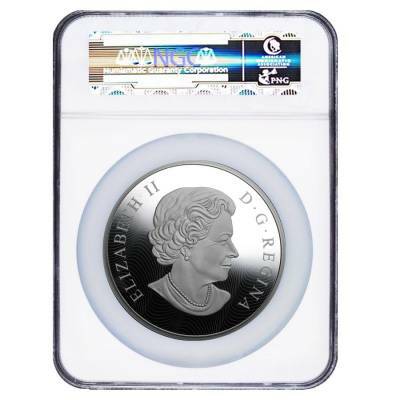 These Silver coins are an attractive acquisition for both first-time precious metal buyers and long-term investors. It has the perfect blend of collectible beauty and investment appeal. Add this commemorative coin to your cart today! As with all of our products, Bullion Exchanges guarantees this coin to be 100% authentic. Item will be wrapped and packaged safe for delivery. My experience with Bullion Exchanges was great, they were very informative and kind.The portrait taken by Yousuf Karsh looks amazing in person. I received my 2015 10 oz Proof Royal Canadian Mint $100 Albert Einstein Silver Coin in no time. Thank you Bullion Exchanges. With this purchase, you earn 600 Bullionaire Bucks 600 BB = $0.60. For every $1 spend, you will earn 1 Bullionaire Buck which is equivalent to $0.001 off a future purchase. 600 BB = $0.60.